A familiar spirit is an emissary of power and is of great significance, granting the occult practitioner the ability to travel between the Planes of existence while serving as her eyes and ears, easily sensing the presence of other spiritual entities, while recognizing the shifting of the energetic tides with a knowing possessed by no human being. 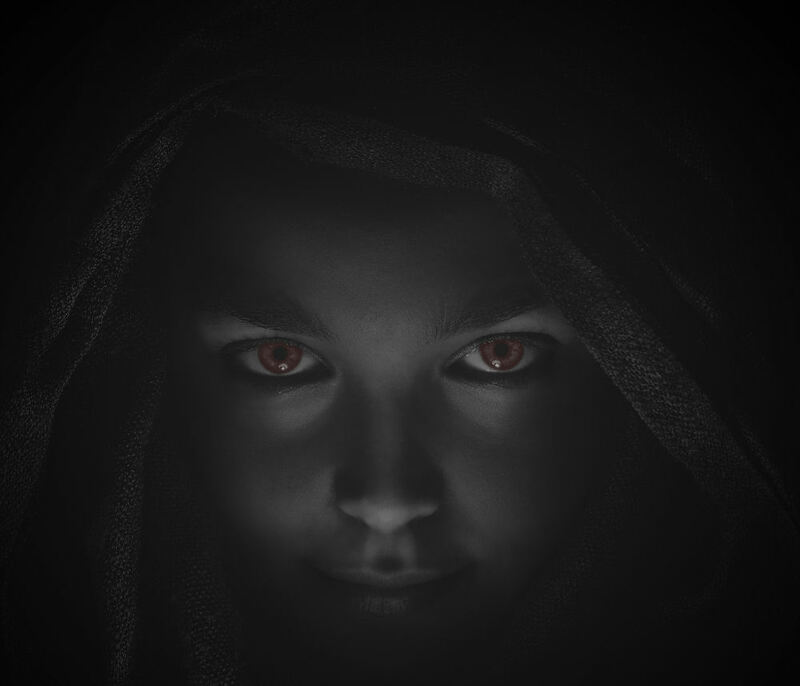 Lodged into a family tree by the Devil after the first born female of a chosen family bloodline went through The Initiation Rite, the familiar grows a special fondness for that female and attaches itself to her bloodline. This bond is inherited upon her death by her first born daughter; there is always a female born of the family bloodline once the familiar is gifted to the family, however it is speculated by some occultists that in order for the matriarch to die in peace, she is required to bequest her familiar spirit to another female of her bloodline in the “proper manner”, and if it is not done, the familiar will bring upon the family a curse causing them great pain, suffering, and misfortune. In their ethereal form, familiars are described as forms with intense color and animated with movement and sound, while in their corporeal form they appear as a long deceased relative or intimate friend of their human partner. This is to ensure that the members of her family become acquainted with the familiar and trust it as if it were one of their own blood relatives; in fact most family members are unaware that the familiar is not a human being at all and will treat it as if it were human. While most familiars willingly serve and are devoted to their human partners, it is important to note that some familiars are deceitful and will harbor their own agenda regarding the future of the bloodline they seemingly serve. I was famished by the time Aunt Rachel had finished preparing the food. The mixture of curry powder, ginger, and cinnamon that she added to the collection of vegetables, egg, and brown rice was not only aromatic and visually appealing, but was delicious. We both were hungry and ate our food in comfortable silence for the first ten minutes of our meal at the dining room table. My aunt had attended numerous family dinners and was acquainted with where Mother kept the napkins and silverware that were to be used in the dining room. She was also aware of the unspoken rule concerning which dinner plates and water glasses were “allowed” at the dining room table and which were strictly used exclusively in the kitchen. I still had so many unanswered questions for my aunt, but I was certain she was unwilling to discuss them with me since she was unyieldingly determined to remain loyal to my Dad’s decision “about his family”; whatever that meant. I still wanted to know where she was trapped? Was she on The Elemental Plane? The Astral Plane? Did she contact Josh, or Ryan, or Mr. Morrell while she was there? How much did she know about my abilities? Did she know The Ancestors? What did they want from her? Was her being trapped my fault? Did Syn demand that they trap her because of my defiance? The questions swirled in my brain as we sat together at the table eating our meal. I felt Aunt Rachel watching me eat, my own eyes focused on the dinner plate before me, examining each piece of brown rice that remained; some of them had attached themselves to the florets of broccoli that lay among them, refusing to let go, finding solace with their unlikely ally in the reality of their pending death. I placed my fork on the table beside the plate and reached for my water glass. I choked on the mouthful of water I had taken, spraying some of it into the food remaining on my plate. I clumsily replaced the glass on the table as I wiped my mouth with the napkin that had been lying in my lap. “Well, yeah. Honestly it is,” I said. I watched her glance from me to the empty plate before her on the table then back up at me. I appreciated that she was experiencing an internal struggle. The fluttering of expressions that played across her face indicated that she was clearly torn between her loyalty to my Dad and some unspoken allegiance to me. Was it more than our blood bond that bound her to me? Her hazel eyes found mine and held them. I was intrigued by her words. On some level she clearly understood my frustration. My curiosity about her visits with my Dad grew exponentially. What did they discuss in the library behind the closed door? I assumed it concerned my aunt’s financial status and that Dad was giving her his professional advice, but perhaps that wasn’t the situation at all. Perhaps it was Aunt Rachel giving Dad advice about me! About my power! Was it possible that my aunt was more of an ally to me than I ever imagined? I watched her, expecting her to continue, but she stayed in that position for a while. The antique walnut longcase clock struck nine. I was convinced she had drifted off to sleep when she abruptly raised her head and took a drink of water from her glass. She deliberately placed the crystal glass back on the table, and looked at me. There was something in her eyes that I had never seen before, a glint or flash of … electricity? Of power? “You mean, he actually became real? Flesh and blood, real?” I asked. I was shocked with her story, not because it made her sound as crazy, which it did, but because of the implications it carried if the story was true. “Yes, Angie, flesh and blood real,” she confirmed.